Mr. Pat Cashion founded Vitreous Glass Inc. in Airdrie in 1995, taking an idea and turning his vision into reality. Vitreous annually collects 90,000 tonnes of post-consumer waste glass, which is cleaned, crushed and sold to three large fibreglass insulation manufacturers who use it as a raw material in their production facilities. Mr. Cashion chose to locate his business in Airdrie for its accessibility and the city’s culture of efficiency and customer service. More than a decade later, he continues to run a very successful business that is committed to being clean, safe and quality operation. Over the years, Mr. Cashion has used his business acumen to strengthen the Airdrie business environment. 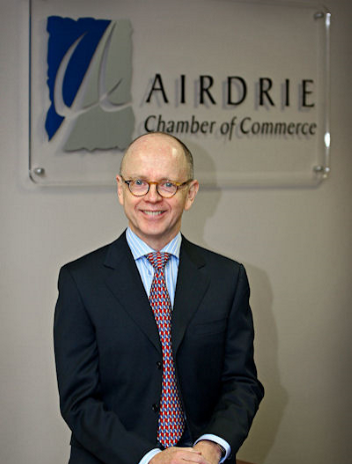 Serving as director on the Airdrie Chamber of Commerce for four years, he was instrumental in assisting the organization with its strategic planning. He has represented the business community on a variety of boards and initiatives, including the enVision Airdrie committee, Alberta 55+ Games, Small Business Week and Youth Entrepreneurship Camp. As a result of his commitment, dedication and leadership, Mr. Cashion is being recognized through the Winning Edge Awards Program as the recipient of the 2010 Airdrie Business Leader Award, sponsored by the Airdrie Chamber of Commerce.